How does the petrol pump do not pump oil? When the vehicle's oil pump is not pumping oil, it should be repaired in time to prevent the failure from expanding. This can be through the inspection of the car to determine the location of the fault, and then analyze the oil pump to diagnose the location, cause and degree of oil pump problems, analyze the car's oil pump to solve the problem. 1) The oil valve is worn. The mechanical impurities in the fuel cause the wear of the oil valve, the decompression belt, or the valve seat under the high-speed flow erosion and the seal is not strict, so that the residual pressure in the high pressure oil pipe is insufficient. When the fuel injection pump is pumping oil again, some of the fuel replenish the pressure in the high pressure fuel line. As a result, the fuel supplied to the cylinder is insufficient, and the fuel is not supplied when the fuel is severe. 2) Worn plunger and plunger sleeve. 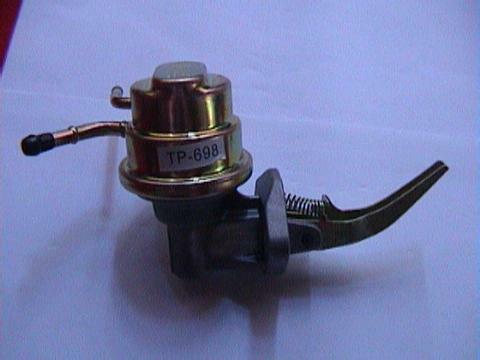 During use, mechanical impurities in the fuel enter the injection pump chamber to form abrasive wear, and the corrosive effect of fuel increases the gap between the plunger and the sleeve, causing fuel to escape from the gap between the plunger sleeve during the stroke of the pressure oil. Leakage, making the oil supply insufficient or not. 3) The oil valve spring fails. The outlet valve spring fits the outlet valve tightly to the valve seat. The seal is reliable and anti-high pressure tubing fuel backflow. If the outlet valve spring is fatigued and the elastic force is reduced, the one-way interception effect of the oil outlet valve is deteriorated, and a reverse flow phenomenon occurs. The result and cause are the same as those described in 2). 4) Insufficient pressure in the low pressure circuit. The low pressure oil line of the fuel injection pump has a certain oil pressure so as to ensure that the fuel quickly enters the pump chamber and ensures that the fuel pump pump oil needs to use oil. If the pump's pumping capacity is reduced or not pumped, or if the diesel filter, the oil line is blocked, or air enters the fuel system, the oil pressure of the low pressure oil line of the injection pump will be reduced, and even pressure will not be generated. When the fuel injection pump is working, fuel can not quickly enter the injection pump chamber, resulting in the injection of oil is not pumped or pump oil is insufficient. 5) When the oil amount adjusting rod or governor is stuck at a position where the fuel supply is reduced or when it is not in the oil supply position, the effective stroke of the injection plunger is reduced or zero, so that the fuel injection pump is insufficient or not supplied with oil. Oil supply. 6) The engine's accelerating adjustment mechanism is jammed or improperly adjusted. The pressure acting on the governor spring is reduced. The fuel supply of the fuel injection pump is limited by the governor, ie, the fuel supply is insufficient. 7) Plunger spring failure. If the plunger spring is fatigued or broken due to long-term compression, it cannot ensure that the plunger is returned in time and the roller body and the cam are in good contact. As a result, the stroke of the plunger is reduced, resulting in insufficient oil supply or no oil supply. 8) Improper selection of diesel fuel. If the diesel with a high freezing point is selected in winter, the fuel cannot flow into the pump chamber quickly due to poor fluidity of the diesel, resulting in a decrease in the amount of fuel supplied. If the diesel does not flow, it will cause interruption of fuel supply; if diesel oil with low condensation point is used in summer, it will cause insufficient oil supply due to its small viscosity and easy leakage. 9) Worn or improperly adjusted cam and roller body will reduce the plunger lift and cause insufficient oil supply. The camshaft bearing will be damaged and the camshaft will be radially offset (downward), causing the pump oil pressure to drop. The amount of oil supply decreased. 10) The pinch of the column is too much due to the clearance between the plunger and the sleeve being too small, or the viscosity of the diesel oil is too large; the roller body is improperly adjusted (adjustment is too high), and when the plunger lifts, the top end will collide with the oil outing seat. Thickened, stuck in plunger sleeve without oil supply.